There is a building in San Jose that conjures up warm memories for those who grew up around here. It reminds them of childhood, family togetherness, and the friendly man who ran the store. 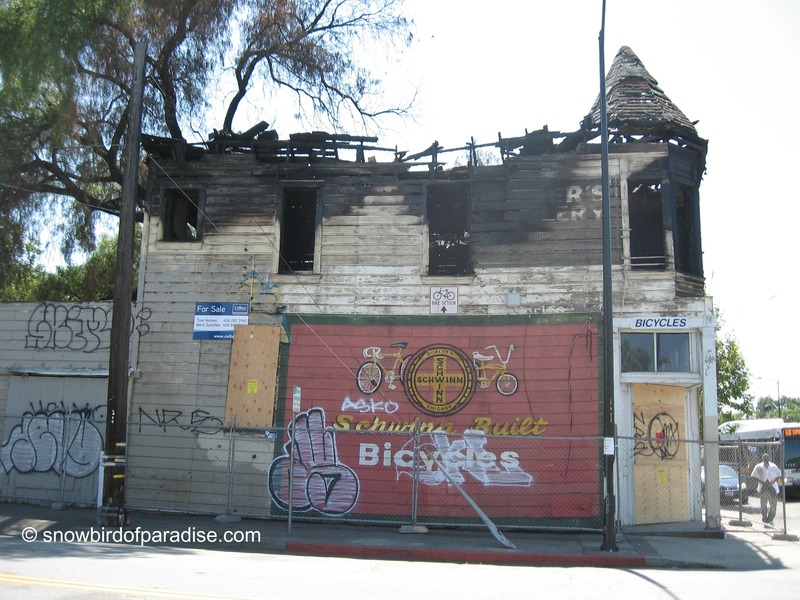 It was a bicycle shop called Faber’s Cyclery, and it caught fire in 2013. I first saw this building in 2009 and photographed it because it was lovely. The building itself was no longer being used as a store, but bicycles were still sold and resold, dismantled and reassembled in the yard beside it. When I posted my picture to Facebook, several local friends and family members added their memories of going to the store as children and of taking their own children there. The store was woven into the fabric of their personal histories. No-one builds houses with turrets any more, and somehow this one had survived. 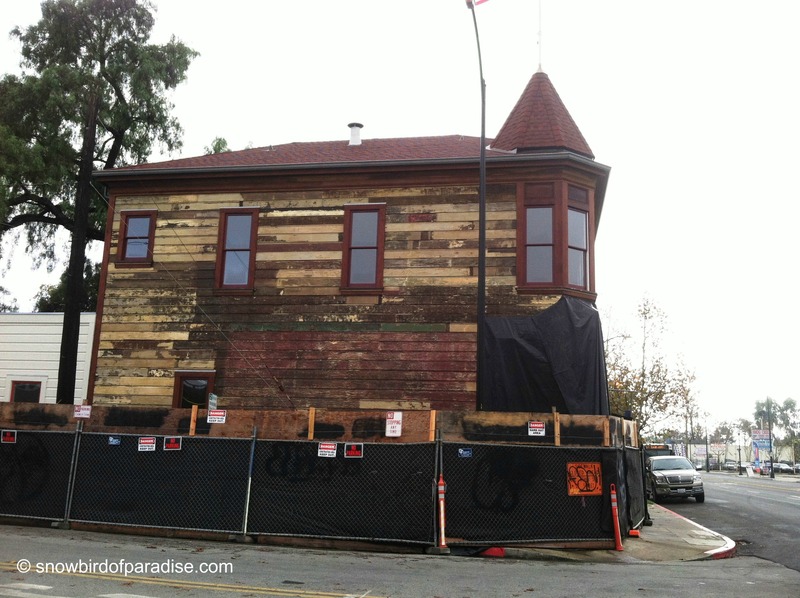 It’s a Victorian style that is still seen in California, even though it takes a lot of work to care for a wooden building that is over a hundred years old. The old bike shop probably met none of the current building codes or earthquake standards, but there it stood, regardless, leaning like an old drunk, defiantly not collapsing. Then there was a fire. I don’t know what caused the fire, but I thought that it would probably mean the end of the place. Someone would come in with a bulldozer and level the charred and sad remains. The site is a large corner lot in a neighbourhood that is close to the city centre. It just didn’t seem likely that anyone would save it. After all, it’s not on the walking tour of historic buildings, it wasn’t owned by any of the city’s elite, and it needed so much work. Then last year I saw that work was being done. The burned out roof was covered in tarpaulins and large girders were put under the main structure. I wondered who was paying for all this effort and just assumed it had been covered by insurance. 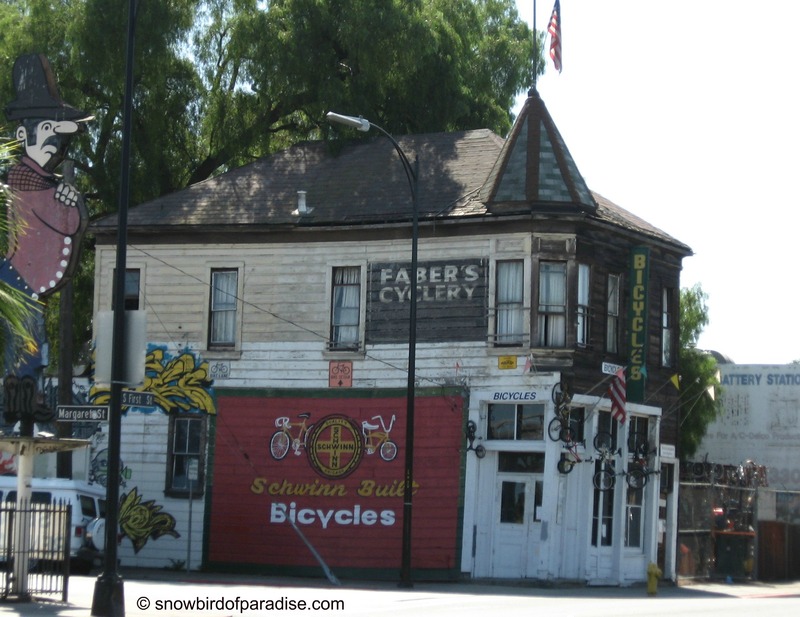 I did a quick online search and found that a group of bicycle enthusiasts had got together to save Faber’s Cyclery with a plan to turn it into a bicycle museum. There is also a fundraising site for the same purpose. They don’t seem to have raised much money, though, so I still don’t know how the reconstruction is being paid for. Whoever made this happen, I am grateful. This tumbling pile that was used for repairing bikes by taking parts from other bicycles, is now being put back together using repurposed lumber. There is a pleasing symmetry to that. And the renovators are not just making do; they are making it better. It now has a firmer foundation, modern windows in the old style, a new roof and new eaves troughs. Maybe it will last another hundred years. I hope so. It is a great pleasure to be able to see Faber’s Cyclery being restored to its former glory; it is even more satisfying to know that there are people who are willing to spend the time and money that it takes to put an old shambles back on its feet. They have given San Jose a wonderful gift, and a reminder that caring for the aged can revitalize the whole community. I’m glad you enjoyed the post, gypsy thinking. I walk by this building two or three times a week when I’m in San Jose, and it is very pleasing to see it coming back to life. Where there’s a will, there’s a way!